The indicator shows household expenditures on personal mobility, which also includes expenditures for car purchase, the operation of personal vehicles and public transport. The data for Slovenia includes the period 1991–2007, while the data for other European countries show the situation for 2007. The data on the share of household expenditures on personal mobility shows constant value in the Republic of Slovenia in the last fifteen years. The average share of the budget intended for transport amounts to 16 % in this period. The majority of the budget is intended for the operation of personal vehicles (fuel, spare parts, repair, etc.) and purchase of vehicles; a significantly smaller share is intended for public transport. The share of expenditures on personal mobility is relatively stable also in other EU countries; the differences are not large even between individual countries. With regard to the share of household expenditures on personal mobility, Slovenia belongs to the countries with the highest share of used funds for this account. Only three European countries (Luxembourg, Iceland and Lithuania) have been ranked ahead of Slovenia in 2007 according to this criterion. In 2007, Slovenian households spent 16 % of their budgets for transport; households of other EU-15 and EU-27 countries spent on average 14 % of their budgets for the same purpose. In comparison with other countries, Slovenian households spend, within the context of transport expenditures, more funds for the purchase of vehicles and operation of personal vehicles, and significantly less for the use of public transport. In 2007, Slovenian households spent one quarter (25 %) more of their budgets for the purchase of vehicles and operation of personal vehicles than households of the EU-27 countries; at the same time, Slovenian households spent a significantly smaller share of their budgets (1.1 %) for public transport in comparison with the households in the EU-27 countries (2.4 %). 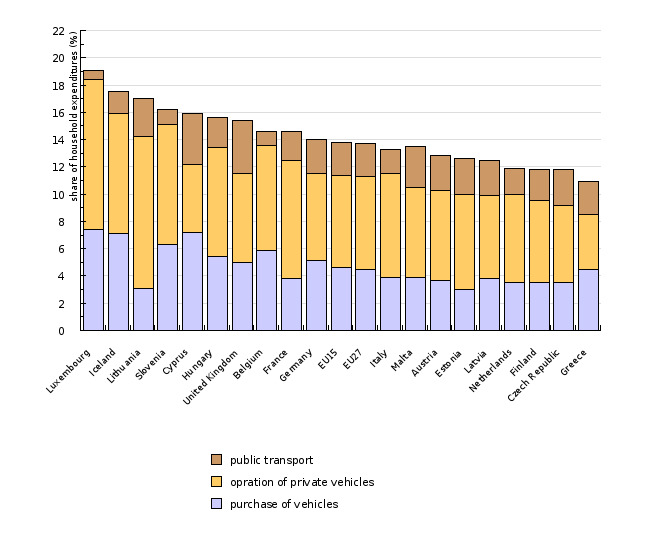 However, the share of expenditures for public transport is in comparison with the expenditures for the purchase of vehicles and operation of personal vehicles in the EU-27 countries as well as in Slovenia at a minimum level (Eurostat, 2009). The share of expenditures on personal mobility appears to increase with income, but the difference is largely due to greater spending on the purchase of vehicles. As wealthier people are more inclined to spend on vehicles as luxuries and status symbols, the greater share of mobility expenditures could therefore be better attributed to these factors. In resources intended for the operation of personal vehicles and public transport, the differences between income groups are significantly smaller. Consequently, the share of expenditures on personal mobility is roughly the same across income groups, although a certain link (especially in terms of higher transport demand, reflected in the larger share of transport work) does exist. For example, expenditures on personal mobility are much lower for households without a car, a situation more common in the lower income groups (EEA, 2005). If the share of income allocated to personal mobility is constant for the different groups in society, increasing the transport prices (internalisation) becomes a useful tool for governments to influence transport volumes. However, it is also believed that people not only spend a roughly stable share of their budget on transport, but also a stable share of their time. As a consequence, travel speed also becomes an important determinant of transport demand, along with costs (EEA, 2005). Another important consequence is that transport policy instruments that reduce the negative environmental impact of motor vehicles (for example, the introduction of more efficient fuels) while simultaneously reducing the transport users' costs will sooner or later create a rebound effect. With reduced expenditures on personal mobility, users will still use the shame share of their income and simply drive more. 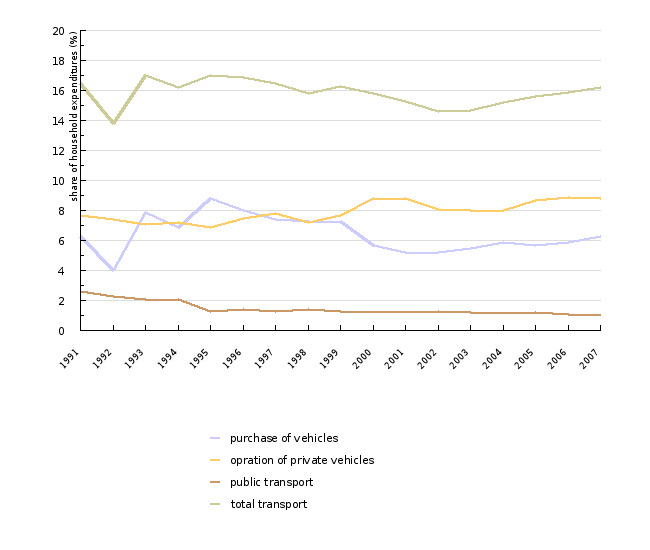 There is a possibility that the volume of transport and environmental pressures will not reduce (EEA, 2005). Date of acquisition for this indicator: 12 August 2009. - Advantages and disadvantages (at data level): The strength of the indicator is the consideration of various and numerous databases for the final consumption expenditures of households for personal mobility. Reliability of the indicator (archive data): The data for Slovenia refers to a longer time series. Although the data for other countries is indicated only for 2007, the source database refers to a longer time series as well. - EEA, 2005: TERM 2005 24 – Expenditures on personal mobility. Indicator fact sheet. European Environment Agency.